Welcome to Bobcat Bungalows in New Braunfels, Texas. 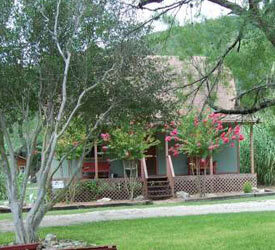 We are a hill country hideaway just off the Guadalupe River and River Road. 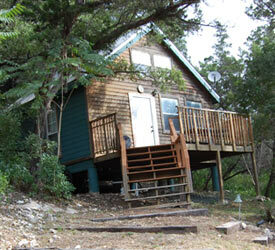 Our secluded cabins are nestled on 8 acres of this Texas Hill Country retreat and is a short 400' from the river. We are located between the Second and Third Crossing Bridges on River Road. The Guadalupe River offers many activities for family and friends to do, including great tubing, rafting, kayaking and fly fishing. 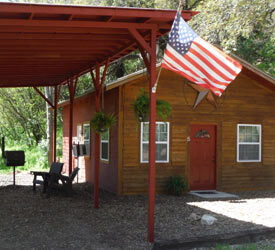 All of our cabins have fully furnished kitchens and baths (please bring your own towels), A/C, satellite TV, Wi-fi, BBQ pits and picnic areas. We are located just minutes from a handful of hot spots such as Canyon Lake, Koozie's Ice House & Grille with store (within walking distance and usually has live music on weekends! ), Gruene Hall, Schlitterbahn and San Antonio is just 25 miles away. Gruene and New Braunfels both offer old town charm with great shopping and dining. Our Game Area has horse shoes, ladder ball, basketball hoop, washers and dart board. There is also a large covered sitting area complete with wood chairs. This Beach themed split level home sleeps 8. Upstairs has the kitchen, bath, LR (futon) and a large bedroom which has two queen beds. The downstairs consist of a bedroom (one queen bed) and bathroom. 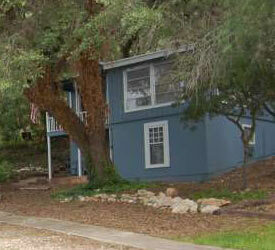 It has a covered BBQ Pit on a nice balcony shaded by large majestic Oak trees. This Fish themed two story home sleeps 11. Upstairs has three queen beds that are enclosed for privacy along with a single. Downstairs has two single beds and a futon. This cabin has a front porch perfect for groups to hang out! It has a large picnic table sitting area with its own fire pit and covered BBQ Pit. This Western themed cabin sits atop the hill overlooking the other cabins. It sleeps 6 and has a very open floor plan. There is one queen bed and futon with a cute loft that has a queen mattress. The back door is glass and donâ€™t be surprised to see Deer cutting through the woods! It has a front porch with picnic table. This cute Rock Cottage sleeps 8. It has two bedrooms (full beds) and the Living room has two singles and a futon. It has a private picnic table on side complete with fire ring and Out House. Ok, the Outhouse hasnâ€™t been used in decades but itâ€™s a cute photo opportunity! This Texas Style cabin has a wood front with Barn Red sides. It sleeps 6. It has a private bedroom (one queen), a super comfortable futon in LR (extra thick mattress) and a loft that has a queen mattress. It has a covered sitting area complete with wood chairs, fire ring and BBQ Pit. Want to Vacation on a River in The Texas Hill Country? 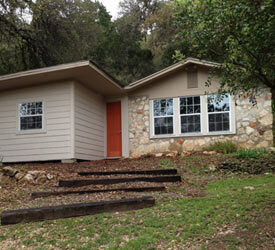 Bobcat Bungalows has several cabins to choose from. Book your vacation today! Copyright © 2016 Bobcat Bungalows. All rights reserved.